I don´t think Joel Telling aka “The 3D Printing Nerd” is unknown to many in the 3D printing community. Joel is a successful YouTuber and he posts projects, reviews, interviews and much more on his channel aswell as on many other social media platforms. One of Joel´s trademarks is to scale thing is up… ALOT and print them on his GMax 3D Printer. This one´s no different but it´s perhaps he overdid it this time? I´ve only met Joel once but he´s certainly someone i´d like to meet again. 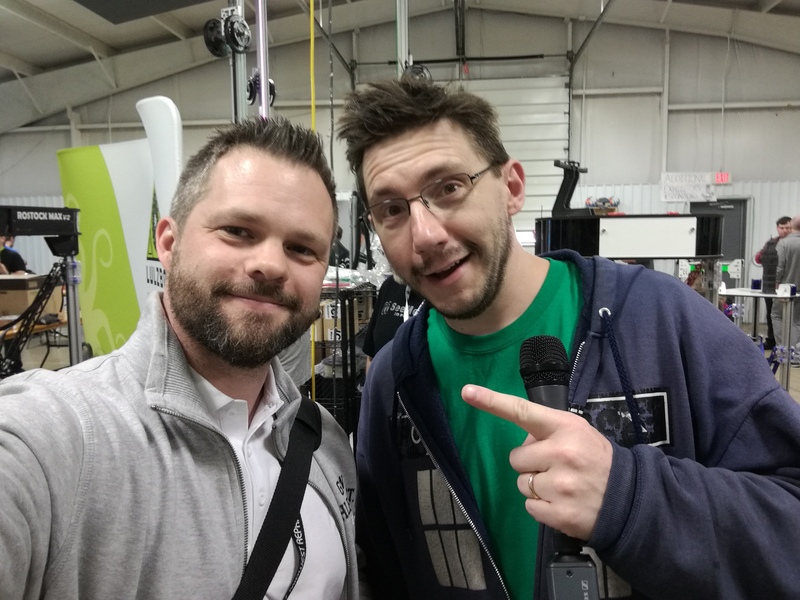 He´s such a nice and down to earth person and despite his stardom within the 3D printing community he always takes the time to speak to everyone he meet. I admire that about him and i think that we all could adapt some of those characteristics. While being a content creator one would imagine fast & easy projects is the way to go to be able to keep those videos coming, right? One might also think that jumping into a project invloving 1000+ hours of 3D printing would be something to avoid then? Apparently it´s not. Joel and parts of the 4X OpenRC F1 car. 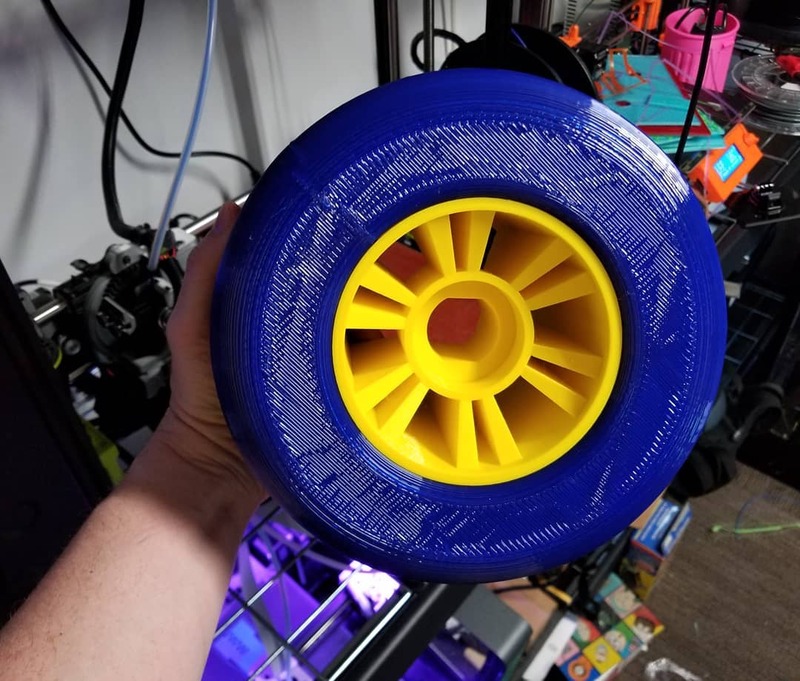 Joel started to print some OpenRC F1 parts a 4X the original scale (1:10) and after a while the idea of printing the entire thing in 4X started to grow. 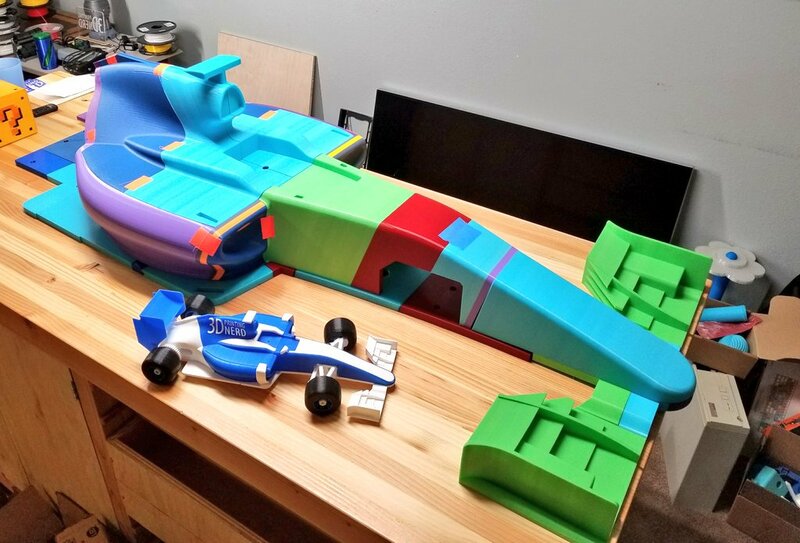 And so he decided to do something crazy, 3D printing what is most probably going to be the worlds largest OpenRC F1 car. The first time i saw it i thought that this is just bonkers… and still insanely cool! Apparently that´s what Joel thought too when deciding to go ahead with this crazy project! Even though Joel was just about to leave for New York i managed to get a couple of minutes for a quick chat about the project. I´ll post a follow up to this story once it´s done! 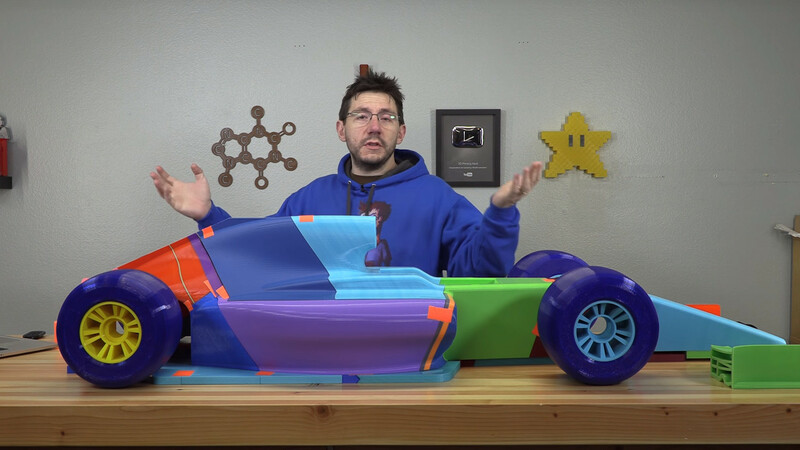 DN: When and how did you come up with the idea as crazy as scaling up the OpenRC F1 as much as 4X? JT: Matterhackers sponsors my channel now, and they sent over some of their low-cost BUILD PLA for me to try out. 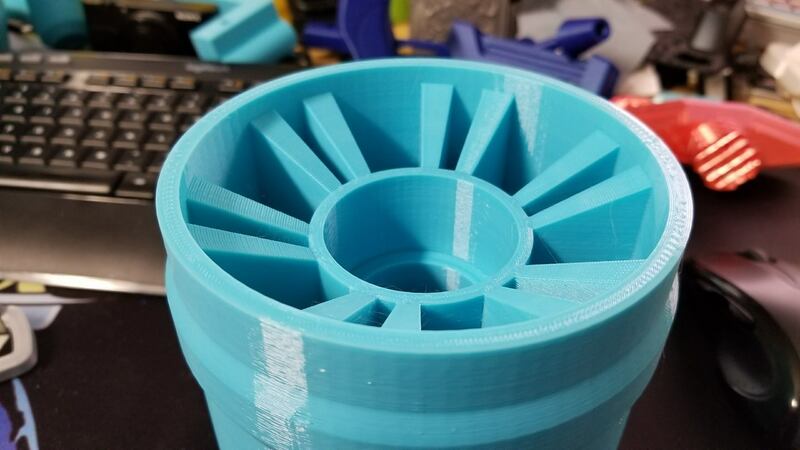 I thought, what if I printed one of the rims from the OpenRC? I wanted to see how awesome it could look, but also test to see how strong I could make the part. I printed with four perimeters, and 20% cubic infill. It’s STRONG, and awesome, and I thought, yes, I’m going to do this. 4X just seemed right. 2X isn’t big enough. 6X would have taken TOO long to print. 4X it was! DN: Being a content creator on YouTube a project of this magnitude takes up a significant amount of time, how are you managing to keep creating other videos during this project? JT: Great question. It’s tough! I never realized just how much of my mind and time a large project like this takes. I was able to get some other videos done, but, this project was always on my mind. DN: Do you have a time estimate on the total print time? JT: Even better, I kept track of everything in a Google spreadsheet. 1,113 hours of 3d printing. DN: As 3D printers doesn´t have unlimited build volume you had to split the parts into smaller pieces. What was the process like and are all parts cut in roughly the same size or did you cut them specifically to fit different printers? JT: I cut pieces specifically to fit certain printers. I used Meshmixer to do a number of “plane cut” operations. It is surprising how easy that was to do, and I even did a video titled “Meshmixer isn’t scary” showing people how to do that. DN: Do you know how many parts you will have printed once this thing is done? JT: More than 80 parts, dude. It’s CRAZY. DN: Speaking of printers, you have a few, how many are you using to build the F1 and which are they? DN: A project like this usually doesn´t come without it´s fair share of challenges, has there been any hickups yet? JT: Non really. I had a few failues but nothing huge. I think the hiccups will come when trying to make it radio controlled! DN: One can´t help wondering how your going to put this thing together. What are you using to keep it from falling apart? JT: Nuts and bolts! I thought about printing some nylon bolts and nuts to use. I scaled up the model, why not scale up the pieces that connect it all together? DN: Matterhackers are sponsoring this project with filament and there´s quite alot of that being used. How did they react when you approached them with the idea of building a scaled up OpenRC F1? JT: They were STOKED. 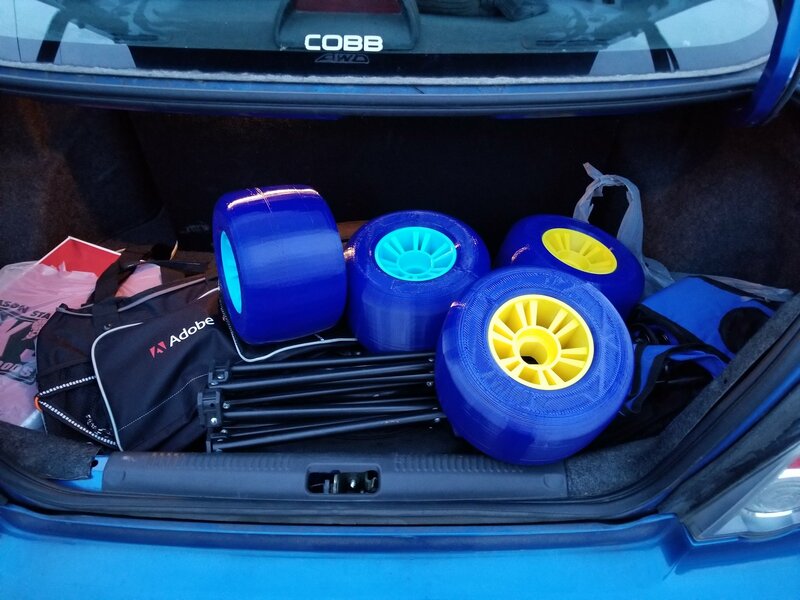 Matterhackers loves sponsoring awesome projects in the community, and this was right up their alley. DN: What are the plans for this awesome project once it´s done? Will you put it on a wall at home? DN: If all goes well you will bring the F1 to MRRF but do you think it will be possible to see it at other venues in the states in the future? JT: ABSOLUTELY. What fun is it if it’s only at my house? It would be awesome to bring it around and let people see it up close and touch it. I think THAT right there is what will really make people connect with it and realize what is possible. DN: Allright, i´m gonna let you get back to it, and i´ll check back in with you for a update once it´s completed! Is there anything you´d like to add before signing off? JT: Yes! A HUGE thanks to you for everything you’ve done for the 3d printing community! A big thanks to Joel for taking the time to answer a few questions and if you want to know more about this ongoing project check the first video in a series of 4. You can find it on Joels YouTube channel. AMAZING! Those tires are HUGE! I’d love to see this up-close…it’s the biggest 3D print I’ve ever seen so far! And it being a R/C car makes it twice as great! I can’t imagine what size servos this would take and if they even make them that big…I hope they do because I would absolutely love to see this flying down a long straight and taking coners!